"This salad is made extra crunchy with fresh apples, celery and toasted hazelnuts." In a medium-sized bowl, combine apples, celery, dates, and orange juice. Stir well to coat evenly. 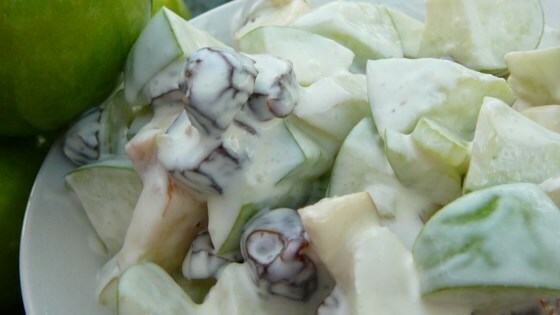 In a separate bowl, whisk together sour cream, mayonnaise and whipped topping. Pour over apple mixture and blend until thoroughly mixed. Chill for several hours. Add nuts just before serving. This tastes really better than I expected! Everyone loved it. I used toasted walnut pieces instead of hazelnuts, and it turned out great! I liked the idea that this recipe used dates rather than raisins. I liked it, but my family wasn't crazy about it. They thought the dressing was a little off and didn't care for the dates. Looks good but you lost me with the frozen whipped topping - I'll try sub suiting yoghurt and sour cream.